After spending 4 years in Ghent (Belgium), I had the opportunity to visit my home country, the Democratic Republic of Congo again. The purpose of my stay there was to undertake research as part of my doctoral project entitled “The role of lianas for the carbon cycle in the tropical rainforests of the Congo basin”. So for close to three months (February 22 to May 10, 2017), I found myself “tracking down” woody liana species in a forest reserve in Yangambi (100 km West of Kisangani). The work was extremely laborious and intensive, I must admit. I had to defy many risks inherent with forest activities such as weather related damage, insect and snake bites, etc. Despite these potential dangers, the work was also exceedingly exciting because very little is known about the biology and ecology of liana in this region. Thus, with the help of a very enthusiastic and motivated local team, I was able to make an inventory of liana species in thirteen one-hectare plots divided into old-growth forests (monodominant and mixed forests) and secondary forests. 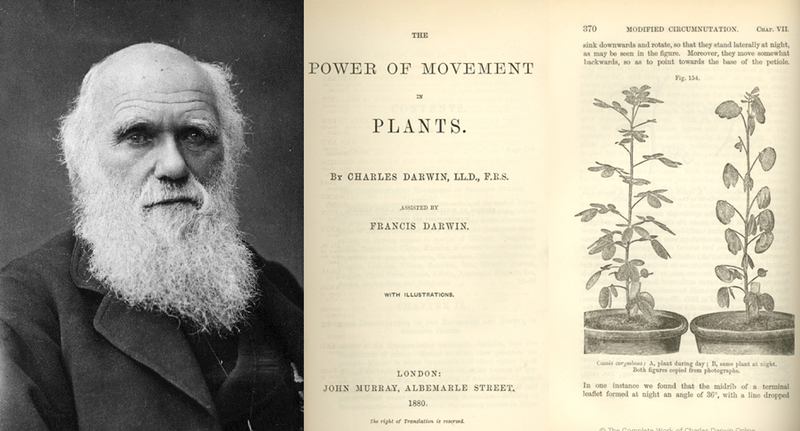 Furthermore, I collected voucher specimens for all those species as well as leaf samples for the most abundant species. I brought all these materials back to Ghent. The next step of the work, which I am already eager to carry out, will consist in identifying these species and characterizing their functional traits in terms of leaf nutrients and carbon content. During a session on tropical ecosystems we presented some results of the TREECLIMBERS project. Hannes De Deurwaerder (PhD student) presented his work on belowground competition between lianas and trees using stable water isotopes. Myself, I presented our initial results on the first liana vegetation model that we are currently developing. Presenting new results at a conference is always an exciting event. How will people react? Will other scientist criticize our approach? But it all went well. We received good feedbacks and suggestions. Several international colleagues were excited about the progress we made so far. So we are travelling back now with new ideas and extra motivation to continue the challenging work of the TREECLIMBERS project. My name is Manfredo di Porcia, I work as a PhD student on the Treeclimbers project. My work is focused on introducing lianas into vegetation models. As you may know lianas play an important role in the ecology of tropical forests. They can constitute up to 40% of the woody stems and their indirect effect is even more interesting. In fact by competing with trees for resources, they suppress growth and increase mortality of the trees that host them. This in turn has a strong impact on the water and carbon dynamic of the forest, for example reducing the amount of biomass (carbon) per area that can be stored. Lianas have been an important focus of field ecologist since many years now, however they are usually disregarded by modellers. Vegetation models (or more precisely Global Dynamic Vegetation Models, DGVM) are computer programs that simulate through equations the behaviour of plants and their interactions with their surroundings (soil, atmosphere, ...). These types of tools are increasingly valuable in ecology because they facilitate the understanding of a system by providing a complementary analysis to actual measurements. For example modelling allows one to study a system at larger scales (field measurements are often expensive), or for longer times (possibly also testing different scenarios like increased CO2, etc.). In our group we are working with a DGVM called Ecosystem Demography (ED). Lianas are now one of the 4 Plant Functional Types (PFT) that populate the tropical forests in silico, the others being early, mid and late successional trees (as in figure). To speed up computations, ED aggregates PFTs in dynamic entities called cohorts. These cohorts interact with each other; it is paramount that the liana/host interaction is properly translated into the cohort dynamic. This is done, among other things, by constraining liana height and by linking their mortality to trees. As you can imagine a good model should give results that match as closely as possible the field measurements. 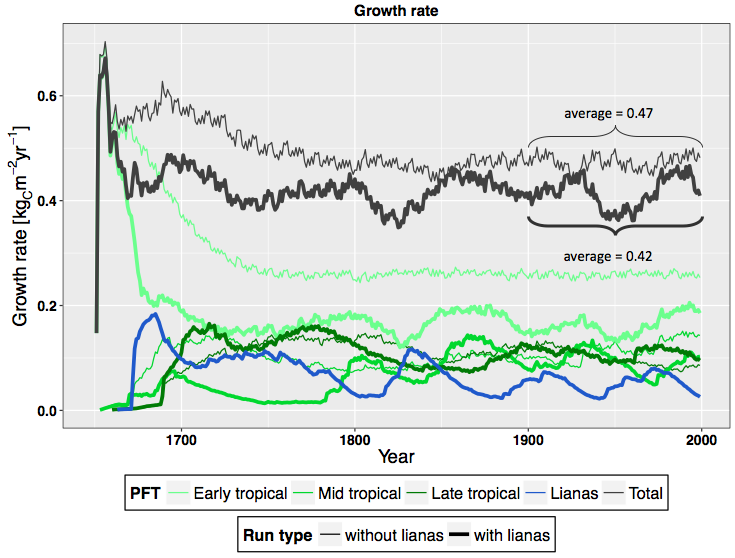 The graph shows the trend for growth rate for two simulations, with and without lianas. At year 1900, when we have reached the "equilibrium", we take the average of the growth rate over the last 100 years of simulations. By comparing their value we obtain that lianas reduce the growth rate of a patch of forest (Paracou, French Guiana in this case) by about 13%, close to the observed value (~10%, van der Heijden et al. 2009). Although modelling might be less adventurous than field work, often there are still many opportunities to travel and discover new places. In particular I am often following the people that developed the model to gather new insights. This has led me to the US (where most of the ED people work) and Panama last year and to Brazil whence I am currently writing from. 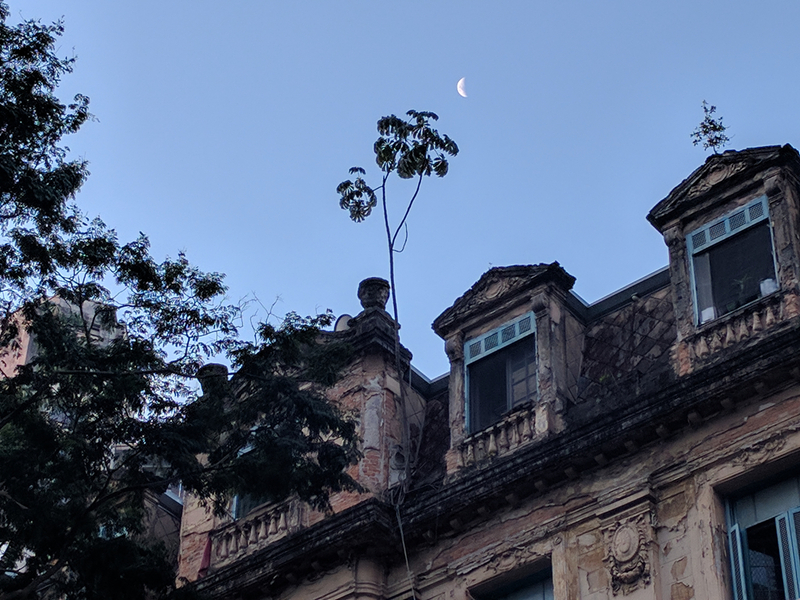 Here in São Paulo, despite working at the university, tropical trees are often round the corner if you know where to look at. For instance in the picture you can see a Cecropia (a typical early successional in ED terms) that chose a very peculiar location to settle down. My Name is Hannes De Deurwaerder. I am working as a PhD student on the TREECLIMBERS project. My research is focused on the role of lianas in the water cycle of tropical forest. Below you can read more about the methods I am using. To get more insight in the behavior and the total amount of water flowing through a plant, scientist ofter resort to the use of sap flow sensors. 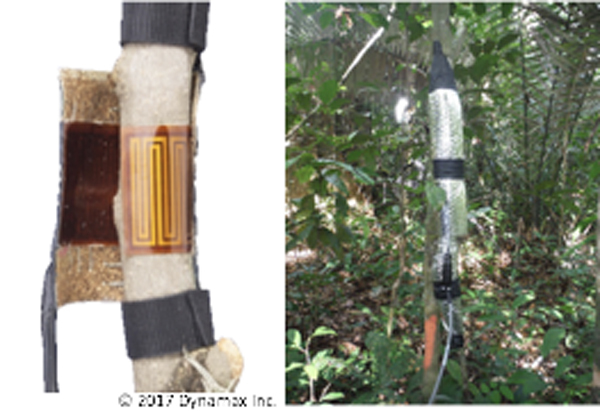 These are nifty tools that use heat to trace the speed, direction and/or quantity of the water moving within your study object, in our case lianas. There are multiple principles thermodynamic sap flow measurement techniques (i.e. Heat Pulse Velocity, Trunk Segment Heat Balance, Stem Heat Balance, Thermal Dissipation Probes and Heat Field Deformation), but in our study, we choice to use the technique of Stem Heat Balance for which we do not have to damage the liana (see pictures below). Using a flexible heater, heat is applied to the entire circumference of the liana stem. Above and below the heater, temperature is measured at a high frequency. When there is no water transport, the heat field will progress through the plant equally fast in both directions (up and down). However, whenever there is water transport upwards, the heat will dissipate in the upwards direction which will result in a difference in temperature registration between the temperature sensors. This is the interesting part since, with some mathematical hocus-pocus, we can now derive the total amount of water moving through the liana. Thus, we can have a look at how lianas react on various meteorological events. For instance, what lianas do when there is an extreme drought? Will they use more or less water? All this information is of importance whenever we want to study the behavior of lianas and why they are increasing during the last decades. Aside from knowing the exact amount of water transported by a liana, it is also interesting to think upon the origin of the water transported. Do lianas get their water from very deep in the soil or rather from shallow soil layers? An perhaps more importantly, do lianas and trees make life difficult for each other by competing for the same water? These are thrilling questions, however, to study processes going on within a soil are very challenging and often ask for very labor intensive soil pits digging. Luckily, there are other ways of deriving information. Isotopes, being chemical element which differ in neutron number and thus in weight, can be used as a tracer for resolving various scientific questions. In the context of our lianas and the questions we address, we use stable water isotopes (i.e. δ2H and δ18O). Whenever a gradient in isotopic water signature in the soil by depth, the water isotopic signature measured in trees and lianas can be linked to the depth of soil water uptake. This soil gradient can occur natural, i.e. when your soil is drying, or can be created by irrigating the tropical forest subsoil with enriched water (containing high abundance of δ2H and δ18O). By using this approach, we found compelling evidence that, at least in the dry season, lianas stay active in the upper soil layers, while trees are actively looking for water more deep in the soil! 29th of January 2017, Milpe, Ecuador. I am currently on a field trip to Ecuador. In the Andes in the North of Quito I am visiting some of our field sites along an elevation transect on the West slope of the Andes. In observational plots on an altitude range from 400 to 3200 m above sea-level we are observing how forests change in composition and properties with height and temperature. 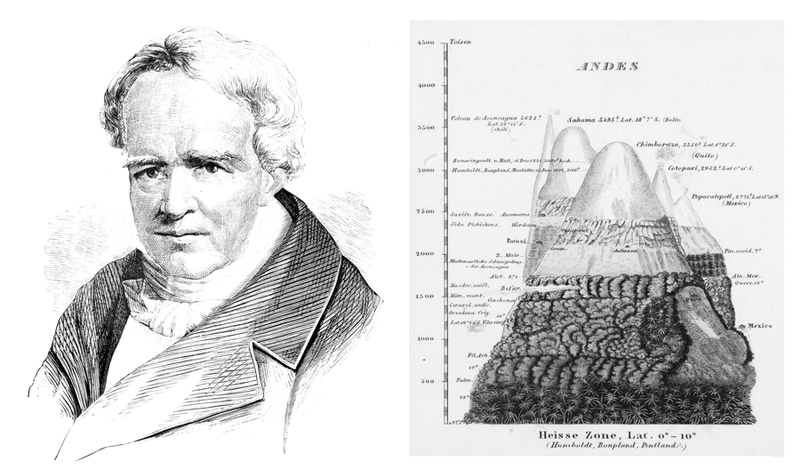 We are not the first to do this: Alexander von Humboldt (1769-1859) was the first to describe the strong gradients of vegetation types along the slopes of the Andes. Within the TREECLIMBERS project we are mainly interested to see how the number and the species composition of lianas is changing with altitude. During a field campaign in August-September 2016, our master student Camille inventoried all lianas in 17 plots (40x40m) in this area. She also took samples of leafs of the lianas. We are currently analyzing the leafs in the lab in Gent to see of their nutrient content and other properties vary with altitude. The tropical mountain forests are very different compared to the lowland forests in which we work in French Guiana and Panama. Here on the West slope of the Andes forest are often covered with clouds formed when the winds from over the pacific ocean touch the mountains. These are called ‘cloud forests’. Very typical for these forests is that trees and lianas are often fully covered with other plants growing on them: mosses, epiphytes and orchids. The TREECLIMBERS project team is working at full speed now. Hannes (PhD student) has found exciting results on the water use of lianas and trees in French Guiana. Based on the analysis of the isotopic composition of the sap of lianas and trees we can find out where in the soil lianas take up their water. We are currently finalizing a scientific publication on these results. Sruthi (PhD student) is taking the challenge to process huge 3D datasets from LiDAR scans of forests in Panama. First breakthroughs are made to automatically identify trees and liana’s in the scans. We have also 4 master students joining our team this academic year. In September Stijn and Pieter went to Paracou in French Guiana to collect LiDAR scans and make observations of liana infestations. Camille and Evelien did a field campaign in Ecuador to inventory and sample lianas along an altitudinal transect in the Andes. Moreover, we were lucky that Bram Sercu (voluntary collaborating scientist) collected for us a similar datasets on an altitudinal transect in Rwanda in October! Elizabeth (post-doc) is analyzing a large dataset of a liana removal experiment of Prof. Stephan Schnitzer in Panama. From this analysis we try to understand how lianas are impacting the growth of trees. Manfredo (PhD students) is making progress in developing a first version of the ED2 model that accounts for lianas. He will present his first results at the European Conference of Tropical Ecology in February. In the coming year our focus will be shifted more and more to these modelling activities. A new post-doc (Marie) will contribute to this. However, additional new field activities are planned in 2017: Francis (UGent funded PhD student) plans to do liana inventories in Yangambi in DR Congo and Hannes will return to French Guiana to repeat his water isotope observations in the remote site of Nouragues. 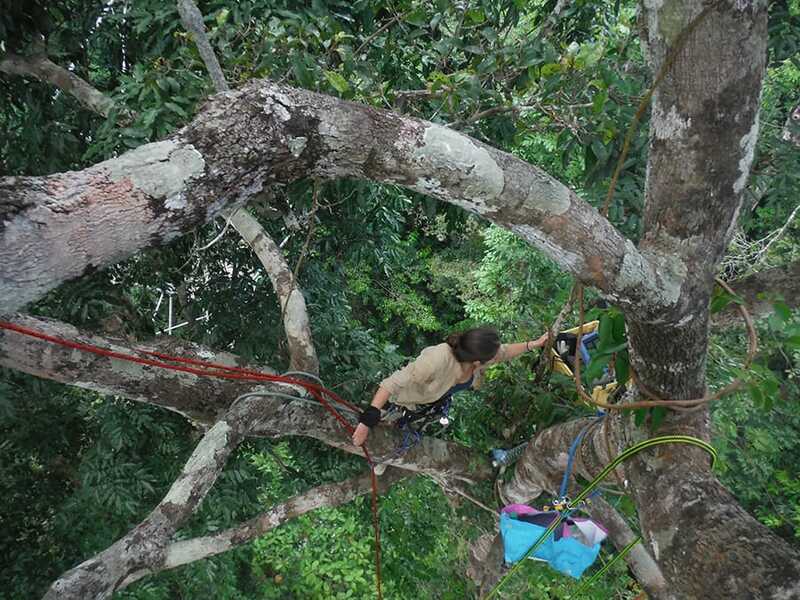 One of the aims of the TREECLIMBERS project is to study the impact of lianas on the vertical structure of the forest. 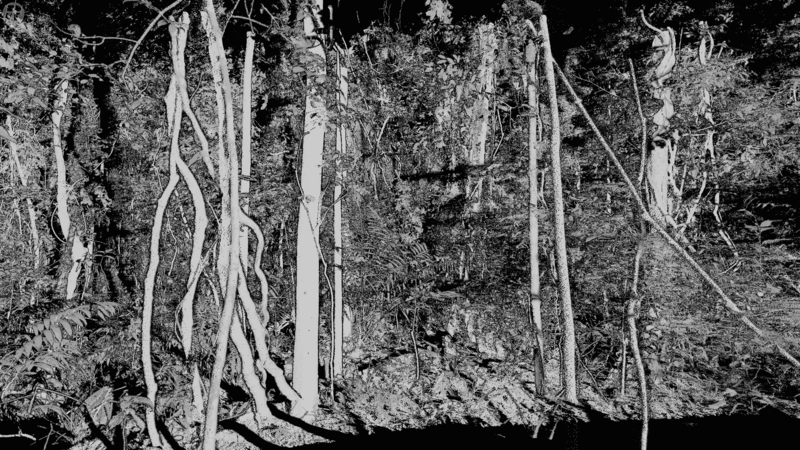 Terrestrial laser scanners are rapid and efficient tools to extract the 3D structure of the forest. 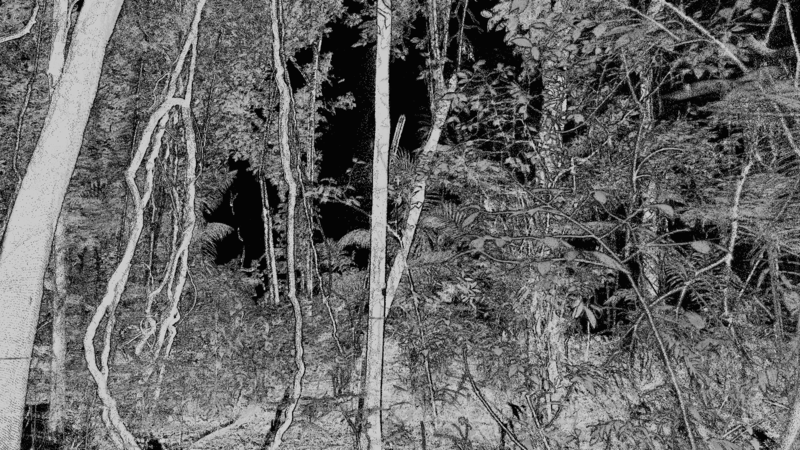 In our study we collected the terrestrial LiDAR data from the tropical rainforests in Panama and French Guiana. From these data, we would like to derive the vertical plant profiles, delineate tree and liana stems in the plot, and derive the parameters such as diameter at breast height, length, height and volume for both lianas and trees. With the derived information, we aim to quantify the contribution of lianas to the forest canopy structure. These two images are extracted from the 3D LiDAR scans. Prof Hans Verbeeck presents his project and talks about the experience of working together with the ERCcOMICS team, to transform his research in a comic. As introduced in the first episode of the webcomic, tropical forests play an essential role in the global carbon cycle. Lianas are key components of these forests and recent observations have revealed that lianas have been increasing in abundance and biomass over the last two decades. Liana proliferation might be a key adaptation mechanism of tropical forests to climate change, with large impacts on the long term tropical forest carbon balance. However, no single terrestrial ecosystem model currently includes lianas. The TREECLIMBERS project therefore aims (1) to understand how lianas influence tropical forest functioning and (2) to assess for the first time the impact of lianas on the carbon balance of tropical forests, by building the first vegetation model that accounts for lianas and by integrating available and new data on liana functioning with innovative terrestrial LiDAR observations of the 3D structure of the forest canopy. Intensive field campaigns are ongoing in Panama and French Guiana.